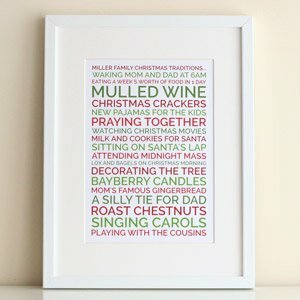 The idea for these began when I learned how to do beaded tapestry from Eliza McClelland at a craft fair in January. Since then I have become obsessed with beads - and my boyfriend has watched me turn into a magpie! A piece of 12 count (12 holes per inch) tapestry canvas. Try and get the double thread variety if you can. 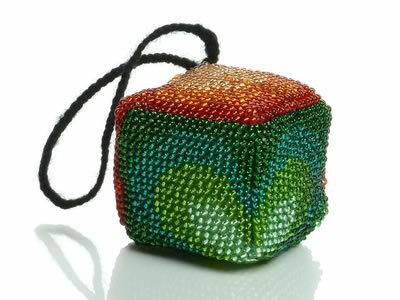 Some seed beads - size 9, 10 and 11 will all work fine. 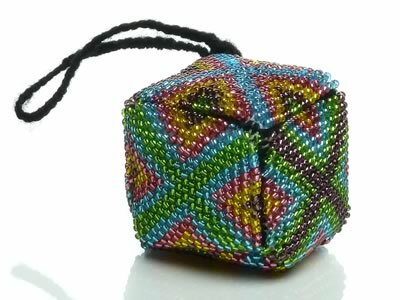 For the cube you will need 6 beaded squares. 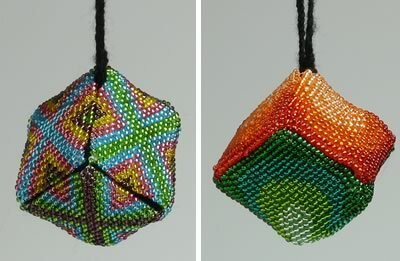 I have made mine 19x19 beads (about 4 cm or 1.5" on each side) but you can make yours bigger or smaller. If you make the cube much bigger then you might need to put some stuffing into it to help it keep its shape. 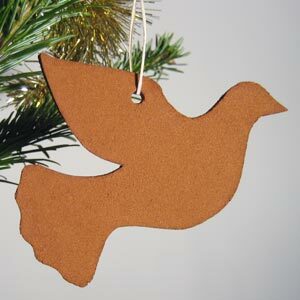 The process for beading these ornaments is lot like doing cross-stitch, in case you have any experience with that. 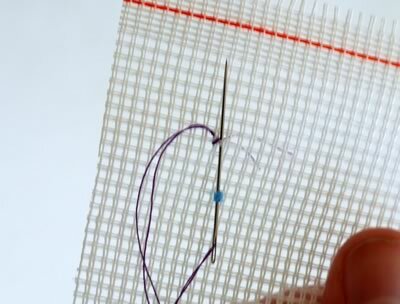 Start by threading your needle onto a longish bit of thread. 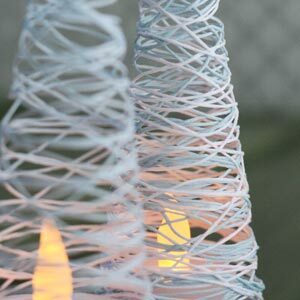 If it is really long it can tangle, but on the plus side you'll need to change threads less frequently. Knot the two ends of the thread together so that the needle can't be pulled off the thread. 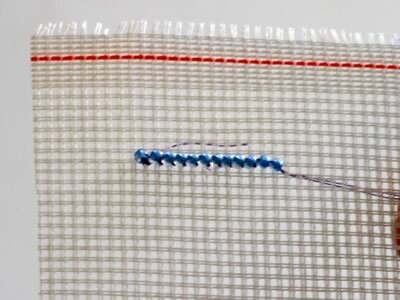 Now put your needle into the canvas where you'd like to start beading and bring it up through a hole that is one hole up and one hole across from where you started. 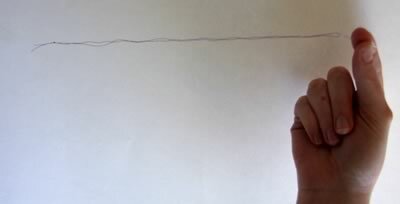 Put the needle through the loop and then pull the thread tight - you should end up with your thread attached securely on your canvas. 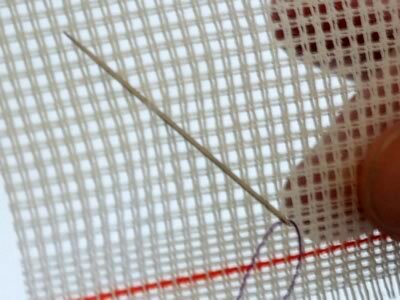 Push the needle through to the other side so that now the knot is on the back of the canvas. 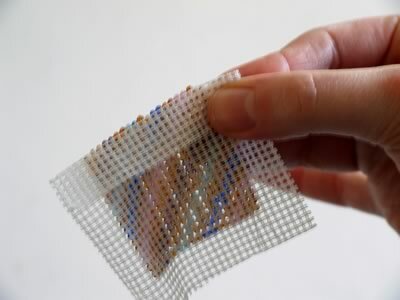 When you run out of thread, push the needle through to the back of the canvas. 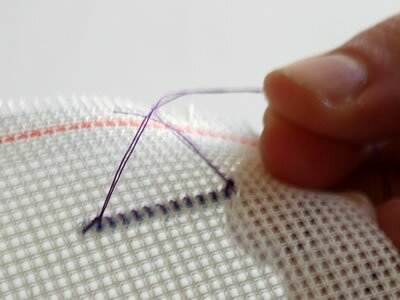 Then slide it under one of the stitches and tie the thread in a tight knot. 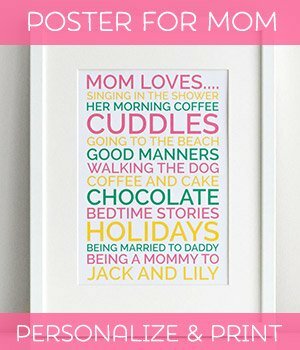 Cut the squares out, leaving a 1/2" border around each. Carefully fold down the canvas on each side of every square - this will help you make a neat edges where two squares join. Thread a length of the wool with the darning needle and make a largish knot on the back. 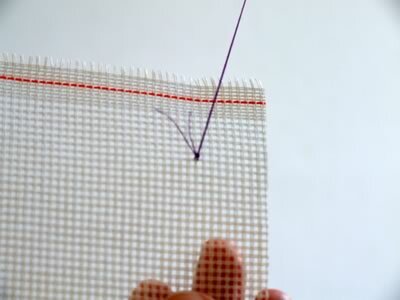 Push the darning needle through the canvas from the wrong side to the right side at the corner of one of the squares. 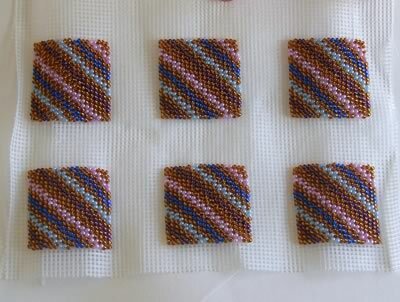 When you get to the edge of the square you can use the same length of thread to join the next square on. When you get to the end of a piece of wool you can tie it off on the inside of the cube. Keep going until you have just three seams left - these should all lead into the same corner of the cube. 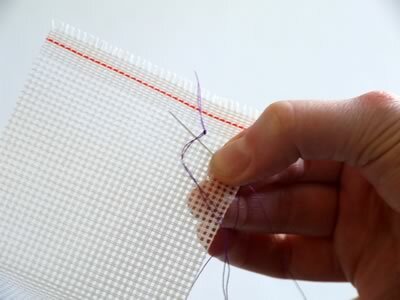 Sew up each seam with a separate piece of wool, starting away from the common corner and finishing up there - don't tie off the wool but leave it quite long. You should now have three pieces of wool all coming out of the same corner of the cube - braid these together and then tie them into a loop to make the hanging loop. Carefully trim off the ends. 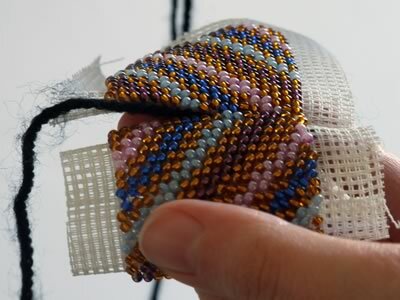 How did you go making your own beaded Christmas ornaments? If you have any questions or comments about this project, or just want to say hi, please use this handy contact form .